Today is the day for all your stock Android fans as the HTC One and Galaxy S 4 Google Play vanilla/stock Android Google edition devices make their way into the Play Store. Keep in mind that the Galaxy S 4 is the “better” device for T-Mobile given the complete spectrum of frequencies available to cover all of T-Mobile’s needs. The HTC One on the other hand lacks the 1700 AWS HPSA+ band so is best picked up by customers in refarmed 1900 PCS HSPA+ areas. Regardless of which device you choose, the option to pick up your favorite hardware with what amounts to a vanilla Android experience may be well worth the price of admission. The special edition HTC One (32GB) will be priced at $599 with the Galaxy S 4 (16GB) priced at $649. It has been said that the Galaxy S 4 is really just a stock Android variant of the T-Mobile edition given the wide spectrum availability, an idea suggested by a report from AnandTech. Both variants will only be sold through the Google Play store and yes, Google says the devices will receive “prompt system updates” but they won’t be coming from Google. Last but not least is the knowledge that as “Google Experience” devices both the HTC One and Galaxy S 4 will come with a unlocked boot-loader. Does this mean Google wallet availability? pretty sure this is still carrier-dependent, as I’ve got an unlocked xperia zl c6506 (lte) on t-mo and when I install wallet I get an error. obviously you can just hack your build.prop, but..
It’s not Carrier dependent as you can use it on a galaxy nexus on T-Mobile. Your phone on the other hand, though unlocked, may not support it due to Manufacturer limitations or firmware, which was locked out by the resist of the carrier it was initially made for. The GS4 supports Google Wallet, the HTC One doesn’t. This was mentioned in a few reviews that came out today. Who would buy the HTC without the AWS band??? it is ridiculous. Those of us that live in refarmed/LTE areas. I used an HTC One X for about a year. While there were spots of EDGE service, it wasn’t bad enough for me to say that I wouldn’t get another device with the same bands. It was only slightly worse than having a T-Mobile phone. I wouldn’t either. The 1900mhz band has terrible building penetration. I get excellent AWS HSPA+ inside my house, but 1900mhz only phones usually get Edge unless I go near a window. HTC dropped the ball by not including it. T-Mobile users are better off to just get the T-Mobile HTC One. These unlocked Google Edition devices seem like they would be more popular with T-Mobile since users get cheaper service for bringing their own devices but HTC shot themselves in the foot by making it only fully compatible with AT&T’s bands. The GS4 does have the 1700 (AWS) band that is a typo. It’s definitely a conspiracy. 4:30 marks the time when The Rand Corporation, in conjunction with the saucer people under the supervision of the reverse vampires are forcing our parents to go to bed early in a fiendish plot to eliminate the meal of dinner. We’re through the looking glass, here, people. Idiot! That is all. No need to be a d&$# about it. It was clearly just a joke. You’re the one being a d*ck by calling names unnecessarily. So, Google can make 4.2.2 run on the HTC One, can HTC and when????? Be careful if you buy from Google Play. I had a problem with my Nexus 4 and wasn’t able to get it warrantied. Not because it wasn’t eligible for warranty just incompetence really. After 7 phone calls and being transferred many times they just couldn’t handle getting me an RA. I’m bummed about it I really wanted to get a S4 without all the extra software. Also getting instant updates from Android is appealing. So I had to write off $350 because arguably the one of the biggest and best software company’s in the world couldn’t handle a simple transaction. To everyone who had every said, “why can’t I get this with stock android”, voila!! Hard Choice, The HTC One with Beats, the GS4 or the Nokia 925 with Nokia’s build quality. Does anyone (David) know what the Nokia 925 will come in at? I need pros and cons cant decide what device to get and my HD7 is dying on me! What a great position to be in buddy! You have 3 GREAT devices to choose from. And BTW I have had the One for little over a month now, its amazing. I’ve not use any recent Samsung Galaxy devices – does anyone know of a list of what features/functions/apps you lose by getting the stock android? Partial answer to my own question. you lose all of the features that Touchwiz and Samsung implemented. you get the vanilla Google exerience minus any features from Samsung. Deacon, that much I know. The question was *what are those features*? oh well i figured saying all would cover it lol. you lose Air Gestures, Smart Scroll, Multi Window, SBeam .. i mean everything Samsung included is gone from this Google version. Fail by HTC for lack of AWS bands. GS4 is the clear choice for those using T-Mobile. According to the Play store specs: https://play.google.com/store/devices/details?id=samsung_galaxy_s4 the S4 does NOT have AWS for HSPA+ either. Either this is wrong, or the information given at I/O 2013 was wrong. It’s a typo. If you go to the support page it shows the AWS HSPA+ band. Does the camera support the Sphere capabilities like the Nexus? So the S4 also lacks the 1700 band? It is not listed there at the Google Play store. Read the above comments. It is a typo. i’d be REALLY surprised if these devices sell out or sell big. not to mention the missing bands. At over $600 a pop (once you factor in the taxes), I highly doubt they’ll sell big. I wanted a stock Android, LTE-capable phone, which is why I bought the GS4GE. 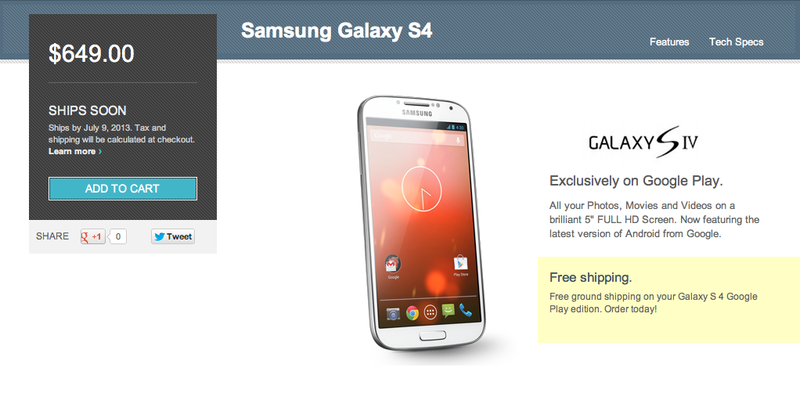 Considering that part of the cost will be subsidized by selling my GS3, it’s not all that bad. I think U have wrong info. Might release for One Developer edition and One Unlocked, not the carrier branded One. I don’t think so. I read that HTC will make the software available if someone wants to switch to stock experience. I was just wondering if Samsung will do the same as HTC doing it doesn’t really helps me since I have S4. Once again, I think you have wrong information. I read something different. I read they may make the software available for people who purchased the Developer and Unlocked versions only, not the carrier variant. They are examining that possibility. I told you so..Check out Kristoff119 link. Unfortunate they’re not selling the black mist S4. Is UMA (WiFi Calling) available on either? From what I read, the GS4 is the same hardware as the TMobile version so I wouldn’t be surprised if it would only need software to enable it but would TMobile make that software available? Who knows. UMA is a big deal to me because I travel internationally and it’s a tremendous cost savings. I’m also usually in office buildings with spotty service at best. it still boggles my mind why the GS4 is $50 when probably costs half as much to build as the ONE. Just think of the raw materials alone, not to mention the massive about of CNC work to mill the whole thing out. The main reason I’m not switching to stock on my HTC ONE is because the Sense Gallery app, with the video montage feature is AMAZING, everything else I could do without tho, well maybe not the smart dial, google should really have that feature by now as both Samsung and HTC had it for years..
You are incorrect. Just because the outside was more expensive to build doesn’t mean the internals are the same price. The HTC One cut many corners in manufacturing by going with a lower speed/cheaper processor, last years RAM, last year’s Gorilla Glass, no external microSD card slot, and smaller screen. You see, HTC had to cut many corners to make their price. Cheaper processor ?? (Both snapdragon 600) they underclocked a their processor by .2ghz which wouldn’t save them any money. 32gb of internal space. It’s definitely a brand power issue. You can buy computer processors with the same exact architecture but with different processor speeds and the slower processors are cheaper. So why would HTC choose to underclock their processor? Maybe, if as you say that processors aren’t any more expensive, they cut the corner on the battery, since the battery is smaller than other phones of the same caliber. Which means they were still cutting corners by putting in a smaller batter and not using the processor to best of it’s ability. The only other reason they’d go with a lower clock speed is if they were having problems with heat, which would be a design defect. So Moses JC, I see you didn’t question anything about them cutting corners by using old tech in the RAM or the Gorilla Glass. Screen size was a design choice but they did save some money by not going with a larger screen. MicroSD slot could still have been done on a uni-body, just by adding a slot in the side but that saved them money. Samsung has the brand power to command a higher price for their products despite them being much cheaper to build. will it have the 4.2 camera? or their generic stock camera? No updates direct from Google? Pass on these at the prices they are. The post clearly states that the updates will come directly from Google. Sorry, I was referring to the HTC statement quoted in the article. David, please clarify. The updates DO NOT come direct from Google. Both phones have kernel from the manufacturers so require the MANUFACTURERSTO DO THE UPDATES. FACT! Manufacturers provide the kernel. Google provides the software that will run on that kernel. Don’t buy into the rampant conspiracy theories that are all over the tech blogosphere right now. Ok……. *chuckles* you know better than every tech site reporting and quoting sources. I’ve yet to see ONE, just one, tech site quoting a Google source that goes on record with a statement that updates will be provided by manufacturers. It seems like tech sites are engaging in creative interpretations. @david Could you please see if you can hunt down an official word on the 1700 HSPA + bands. Google has conflicting information on their main landing site versus others. Engadget reports it doesn’t have it. It is true according to the landing page the HTC one ge has aws bands for LTE. Yes. Its the hspa+ was band the HTC doesn’t have. My bad! But if you lose LTE coverage then oh well. Fact Is if you don’t have a nexus, you don’t have a nexus! it was not a nexus device. thats why you didnt get timely updates. In many ways it was the same as these phones, just like my G2x and mytouch. The problem with each being manufacturer updates, as these are, unlike how they were initially anticipated being updated. Google has since said they will not be updating these. Yeah the update is coming from Samsung & HTC. Google will be working directly with them to ensure timely updates, and because these skip all carrier processes and just get a quick test with the necessary added firmware/software to make things like Beats work, it should take no time at all for updates to be pushed direct. Carriers ruin everything, that’s why Apple has put themselves in the position to rule the carriers, and not the other way around. S10shane is correct. Your G2 was NOT a Google Experience phone at all. Just a lightly skinned Android OS. I can’t believe you’re getting downvoted for stating the facts. Even though it was branded “with Google” on the back, it was a T-Mobile carrier exclusive device, featuring the same exact bloatware that’s included on all other T-Mobile smartphones. If I recall correctly, this was the first T-Mobile phone to feature Wi-Fi calling, which was baked into the ROM. Google had nothing to do with updating that phone; all the updates were still “tested” and rolled out by T-Mobile. The Google Play editions are unlocked/unbranded phones that are not tied to any carriers. Google has gone on record, stating that the phones will receive timely updates, directly from them. Does the S4 (Google experience) support all of T-mobiles bands like they said that it would at Google IO? Has anyone bought it and tested it out?